Would you like to see the world from a bug’s perspective? In “a bug’s land”, based on the Disney·Pixar film, A Bug's Life, you can do just that beginning with the hilarious 3D movie It’s Tough to Be a Bug. 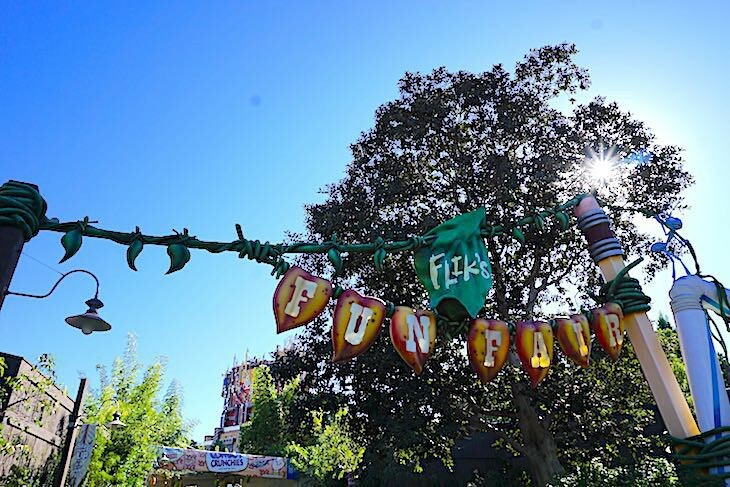 Then the little ones can have a blast of time at Flik’s Fun Fair and the many pint-sized (or insect-sized for that matter) attractions in this area of the park. Hopper in "a bug's land"
It’s always twilight in the underground waiting area where chirping crickets sing Broadway tunes from such insect shows as The Dung and I (featuring the hit song “Hello Dung Lovers”), Beauty and the Bees, and A Cockroach Line. Flik (the star of A Bug’s Life) is the host of this creepy-crawly 3-D movie of assorted bugs who only want humans to understand them. But much to the glee of the audience seated in the theater, they just can’t help misbehaving. A favorite opening act is the stinkbug who accidentally lets his smelly, gaseous fumes rip into the crowd. As the show progresses you’ll be doused with bug spray, stung sharply in the back, and showered with termite acid, all innocently achieved through special effects. Receive one final surprise as the beetles, maggots, and cockroaches exit safely ahead of you. This is one super show, a highlight of the park! 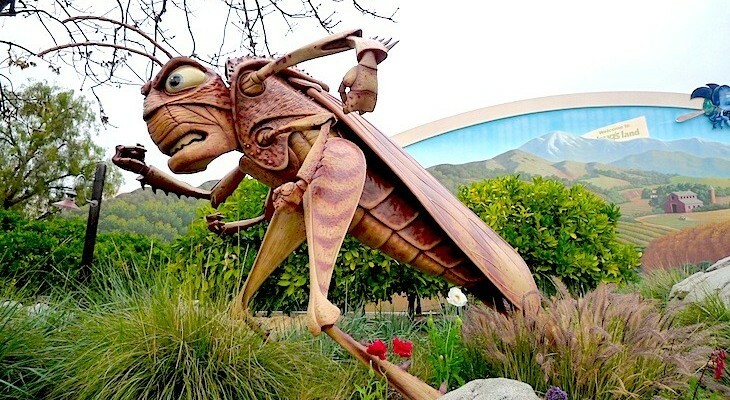 Cara's Tip: Definitely one attraction too intense for young children, particularly when Hopper, the despicable grasshopper from A Bug’s Life, scares the dickens out of every child under age five. If you’d like to sit in the center of the auditorium, hang back a little in the waiting area and allow some of the audience to enter ahead of you. And try not to sit on the far sides of the theater where the 3-D effects are slightly minimized.